With all of the costs in maintaining a household and paying for ongoing living expenses, the single most important and critical to the future of the country is that related to the raising of children. Since 1960, the U.S. Department of Agriculture (USDA) has provided estimates of expenditures related to raising a child from birth to age 17. Related expenses range from food and housing to education and medical care. The USDA closely follows and identifies the various incomes for families, as well as the number of children in families. What it has determined over the past 53 years of collecting data is that families with different incomes spend differently on their children. In addition, single parent families spend less than dual parent families who have the ability to afford greater expenses in raising children. 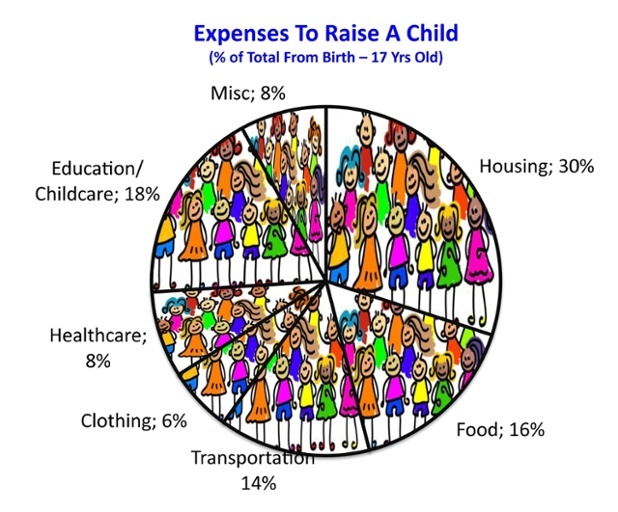 Certain expenses rise as children grow older, no matter what income group a family might be part of. These expenses include food, transportation, clothing, and health care expenses. As children grow, they tend to eat more as well as spend more on transportation once they start commuting to more activities at ages 15-17. Childcare and medical expenses were generally higher for children under the age of 6. The USDA estimates that a child born in 2013 will cost a dual parent family $343,256 from birth until high school graduation in 2030. The $343,256 figure is the average estimate among low, mid, and high-income dual parent families with two children. Various savings plans designed for children may allow parents to adequately save for planned costs, as well as for unforeseen expenses. Having accounts set up solely for schooling and healthcare expenses not covered by health insurance is a good idea. As an example, some children will require braces in their early teen years, costing an average of $5,000, and in most instances not covered by health or dental benefits. Savings set aside for these purposes tend to smooth out expenses as they occur, as opposed to having to place expenses on credit or borrow at excessive rates.